Due to massive amount of users (we're really lucky with that) our servers are mostly totally overloaded. That means, main page, which is on the same server as the ISOs and so on, isn't reachable. The little server we're currently providing doesn't have enought power for providing a good service for all users. The main page can't be visited, the ISOs can't be downloaded and the Update Manager (Repository) can't be used if the server is down because of overloading. We're of knowledge that our users want to be up-to-date via Update Manager (Repository) and we can't offer this with this server. On releases we already tried to catch the traffic by blocking the availability to download other Snowlinux ISOs. This didn't helped much and we're knowing for the next release, that this didn't helped much, now. This is the reason why we decided to arrange new servers to the Snowlinux server farm. We're of knowledge how much power the new server has to provide. But we're also of knowledge that this costs amount of money. A server simliar to these details costs amount of 43 USD per month and 523 USD per year. Until now we paid our server on our own. It isn't possible for us to apply such an amount of money to pay the new server. It only makes sense for us, to be able to pay the server for 1 year in advance. What will happen with these people who donated money? Surely the will announced here on the Snowlinux main page. At a summe of at least 5 USD they get the avaibility to announce their project here. Snowlinux 2 "Cream" Cinnamon released! 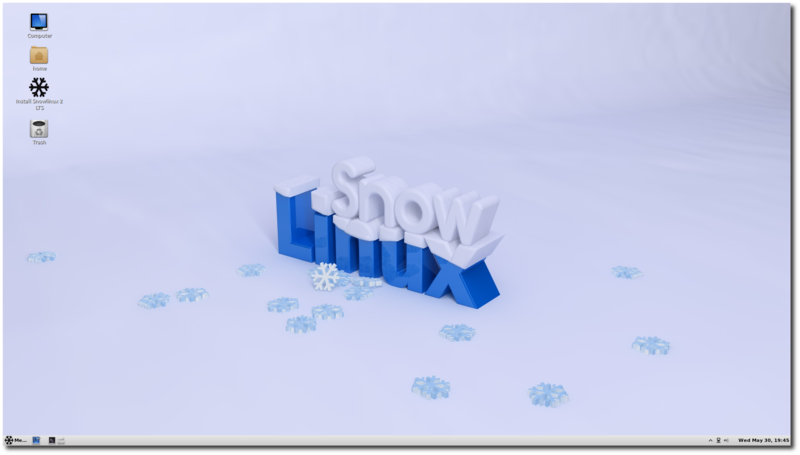 The team is proud to announce the release of Snowlinux 2 "Cream" Cinnamon. If you find bugs please post it in the blog entry or join our IRC channel: Live chat or irc.freenode.net #snowlinux. Snowlinux 2 "Cream" is based upon the LTS edition Ubuntu 12.04 "Precise Pangolin" and is supported for 5 years until April 2017. Because of the fact of LTS this edition is extremly stable and fast. Due drastic changes with Gnome 3 and Unity, Snowlinux is getting as always a traditional desktop like Gnome 2, the Gnome 3 fork Cinnamon and the Gnome 3 Fallback. Snowlinux 2 "Cream" is based upon Ubuntu 12.04 Precise Pangolin. It comes with the long-term-support (LTS) Linux kernel 3.2 which were made available upstream and Cinnamon 1.4-UP3. It has installed chromium-browser, icedove, banshee and shotwell by default. Snowlinux 2 "Cream" is a LTS edition and supported until April 2017. Snowlinux 2 "Cream" is 100 % compatible with Ubuntu's Repository.